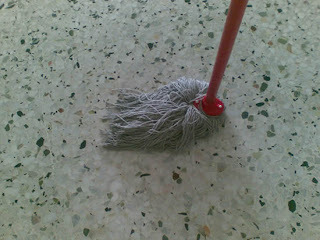 Finally I took a picture of the mop I used at our apartment in Dubai. I didn't plan to bring it back but the packers in a hurry had made the decision for us. I suppose mops all over the world look the same. Unlike many, we didn't hire a maid in Dubai or use a part timer. We do the cleaning and ironing ourselves. Back home in Singapore, our part time cleaner decided to retire a couple of months back, so we are DIY now too.